Confucius once said that if you choose a job you love, you'll never work a day in your life, especially if that job is "thinker". Be wise and get other people to do jobs you hate, or make dough doing them yourself, with AirRun. 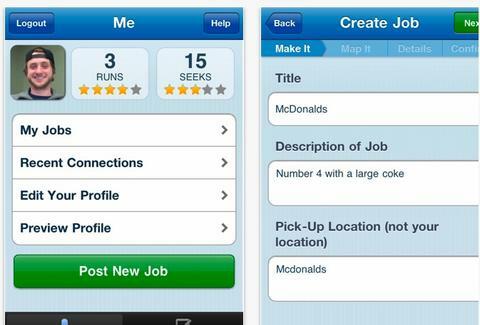 Run's a new iPhone app that connects work-seekers with work-doers, helping you make extra cash through odd jobs or assign simple tasks, chores, and errands to a temporary employee of your choosing, started by an admittedly lazy guy who realized his idea had the opportunity to create "an endless supply of jobs in a tough economy", because every now and then even a Kia with monster truck wheels needs work. "Seekers" fill out a "Create Job" page with a title, description, and location of your needed (preferably legal) service (e.g., pick up my dry-cleaning, mow my lawn, walk my lizard), then map the location of where and when you want it done, and say how much you'll pay your "Runner", if Dynamo, Subzero, or Buzzsaw haven't killed him first. Get your own hustle on by hitting the "Marketplace" tab to see a list of available gigs in two views: "Map", which shows their exact locations on a Gmap with brief descriptions that're viewable after you click on the pins, and "List", which takes a GPS-identified area and highlights all the jobs, handy when Steve wants to contact his illegitimate kids. To make sure you're not being hired by a janky worker/serial killer who's really awesome at walking lizards, they've set up an evaluation system that ranks everybody on a scale of one to five stars, and also lets you leave written feedback -- which, if you are Confucius, will be accompanied by the real reason he didn't have to work: winning lottery numbers.